Stephen Scholz started his running career like many others. The Bridgeport, Connecticut native had been a runner since his late teens but never had any real structure or goals. He began his running journey with 5 and 10k races before running his first marathon. After his second marathon Scholz upped the bar, set a goal and trained with more purpose. Using a Hal Higdon Marathon plan Scholz set out to run a PR and break the 4 hour barrier. Like any journey worth taking, it wasn’t easy. After years of running shorter races Scholz had progressed to the half marathon. Then in 2007 a colleague of his ran the New York City Marathon. After watching her train and race he made the commitment himself. “We went down and watched her and to see the crowd and environment of the marathon- the combination of all of that- it just clicked and I said ‘I’m going to do a marathon,’” remembers Scholz. Again Scholz took a break from the marathon, focusing on cycling and triathlons for the next year. But soon though the marathon was calling again. By this time he had transitioned from his old tracking system and had begun using TrainingPeaks on what he called a “casual” basis. 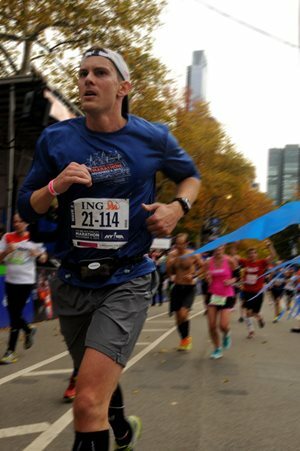 “It was progress from using this Word doc journal system that I had to saying ‘I’m sure there’s an application that can make all of this a lot easier.’ I created an account and it really worked for me.” After signing up for the 2012 NYC marathon Scholz started looking for the next step to take on his journey towards a sub 4 hour marathon. For his third attempt at the NYC Marathon Scholz sought expert help and instruction. “I was at a point where I said I want to utilize what resources are out there that I can use to optimize my training and kick it up to the next level,” he commented. Scholz decided on Higdon’s 18 Week Intermediate Training Plan, purchased it and applied it to his TrainingPeaks account. Immediately he saw how having expert instruction made a difference. “It was the basics of the stuff that I’d been doing, but the structure of it just made perfect sense. It was like an ‘aha’ moment,” he said. Unfortunately, Scholz did not get the chance to showcase his new speed and endurance. Just days before the race Hurricane Sandy ripped through the East Coast, causing millions in damage and forcing organizers to cancel the 2012 NYC Marathon. Runners were offered a choice: get a refund or be entered into next year’s race. Scholz chose the latter, knowing he had unfinished business. After a brief layoff of training and some casual training through the winter and into early spring it was back to getting in the miles. Once again Scholz was using a plan from Hal Higdon, but this time he decided to use the Advanced version of the plan he’d used earlier. “I got a little aggressive. I didn’t know if it was going to work, but I knew I could always dial it back down since I knew what the intermediate plan was like.” The plan was similarly structured but the mileages and the tempo of some runs were a bit longer and faster than the first plan he’d used. He also learned the discipline to hold back when needed. For many runners, pushing when they shouldn’t is a common mistake. Having the discipline to hold back at times is often what leads to breakthroughs. “One of the things that I find interesting is you have a three mile run and you have a great weekend and you feel so good and you say ‘I’m just going to blast this run’,” said Scholz. “But you learn the reason why that’s not good. Just because you have the gas and feel good at that point, it’s not about any one single individual run. It’s about that big picture. It’s about printing out the 18 weeks of what you’re going to undertake and how it fits together. No one piece is going to be the difference maker.” That long term view would help him down the road. It started at as one of those little niggles that runners often feel. Around 10 weeks into the plan his left knee was hurting after a run. After running through it for several days he took a few days off hoping to rest up. His weekend long run ended after just 5 miles due to the pain. Scholz knew he had to rest. Yet Scholz got through it by listening closely to his body and trusting that he was doing the right thing. After seeing a doctor and getting confirmation that there was no major injury and the pain was from his IT band, he was told to rest another few weeks before trying to run. After nearly three weeks off of running, the training began again. With around 7 weeks left until race day a big decision had to be made. “My concern was that I’d missed some of the longer runs and also I was at a crossroads because I was just about to start the taper,” said Scholz. Should he still taper even if he hadn’t gotten in the long runs or should he start back where he left off and try to get in more miles? Some of his running friends recommended he push the limit and get all the miles in. Ultimately though, the conservative approach prevailed. He started back where the plan was in the cycle, willing to forgo the extra miles in return for more time to recover from his injury. Even with his injury, Scholz was optimistic. “I felt really confident just knowing that I had used the tools of the Hal Higdon training plan and logging all of my runs in TrainingPeaks so I was able to go back and see all of that progress.” Looking back over the same 18 weeks span from his 2012 training Scholz could see that his pace had improved. “I could look back and say ‘here’s where I was then, here’s where I am now’.” But he also had the doubt of the injury still lingering. 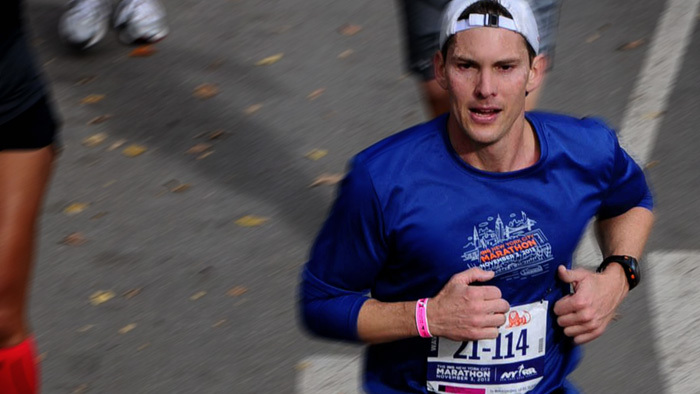 For his third time running the NYC Marathon, Scholz did away with his iPod. He had worked hard and persevered through adversity to get to the start line and he wanted to feel every step, every breath of this event. “I didn’t want any distractions from what I was doing. I really wanted to be dialed in,” he said. His plan was to start more aggressively during the first half of the marathon with the idea that if the pain came back he could dial it back a bit. Coming through the first half of the marathon he was feeling strong. By mile 22 he started to actually increase his pace. One of his fastest miles of the entire race was during this period. In the last miles, Scholz knew he would break four hours. “I was trying to balance the adrenaline rush and the excitement of the time that I thought that I was about to accomplish with the thought that pushing it too hard could be disasterous,” remembers Scholz. His description of the final stretch is one that many runners can relate to. “It’s like a cheesy TV montage,” he said. “It’s like a montage of 18 weeks of training, long runs on hot days through the summer, tempo runs, hill runs, sprints at the track. It’s making time to follow a schedule, the picture of Hal from his website, TrainingPeaks entries, all of the training and all of this energy and excitement and people cheering for you and seeing the finish line and giving it everything you have and feeling really good about an accomplishment.” Crossing the finish after 26.2 miles, Scholz had shattered his goals of setting a new PR and breaking 4 hours with a final time of 3:27:38. Once again the marathon is on hold. Scholz is looking at other marathons to spice things up. He’s also turned his attention to bring a 10 mile running event to his home town, “I’m trying to transition a bit and become a bit of a race organizer. Having gone through this experience I just found it so motivating,” he said. Stephen Scholz is really no different from any other runner. He set out to achieve a goal, used his resources as well as he could, made smart decisions and executed on race day. His journey is one that any runner can take, and that’s the beauty of endurance sports. While we all have different goals and challenges to overcome, we all understand that the journey is the reward.